Paul, Karen and Gary sent a set of photos which have been archived on Flickr. 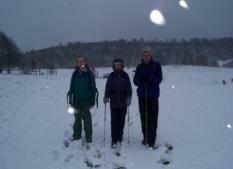 OK, so I haven’t been on many of your walks this year and it was snowing a bit, but 3 walkers turning up! Luckily Steve, Gary and Karen weren’t scared off by a little bit of snow and even managed to find the right car park. We waited until 0910 just in case there were any late entries, but no luck, so we set off into the white hills, just the 4 of us (Steve assures me it’s not a record, he’s been on a walk where only 2 walkers turned up). Today would have been a testing walk even without the intervention of him upstairs. We went via Tring Park up to the Ridgeway, then turned left and headed round the side of Tring and off to Aldbury, up the hill to the Bridgewater monument where we had our coffee break. Then it was down the green (not so green today) half a mile to Aldbury College to admire the architecture and then out of the estate and onto the Chiltern fields and valleys heading for Whipsnade. 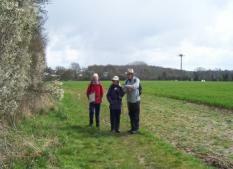 We stopped at Studham Church for a quick lunch before pressing on to the zoo. By this stage the snow was disappearing rapidly as you can see in the photo. Yes that is the same day! In fact it was about 2 hours after the first photo. Soon we arrived at the zoo. It was here we saw a variety of wallabies, deer, camels, bison and even a house martin (who was probably even more surprised by the weather than we were!) We then crossed a deserted golf course before heading down to Dagnell. From here we followed the Icknield path all the way round to Ivinghoe Beacon where we had another coffee break before heading back to Tring via Pitstone Hill. My thanks to Steve, Gary and Karen for making the effort, it wouldn’t have been the same on my own! Hopefully numbers will pick up as the weather gets better!